You've got it made in the shade with the darling Kate Spade New York® Rose 3D Camera Bag. Handbag made from strong 100% interwoven raffan. Top fold-over lid decorated with camera inspired appliques. Hand-applied raffia straw embroidery featuring colorful watermelon piece. Front faux camera lens with brand name logo on closure flap. Flat base provides upright structure. Lined interior features back-wall slide pocket. 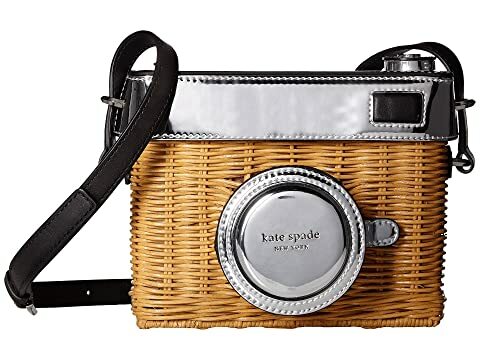 We can't currently find any similar items for the Rose 3D Camera by Kate Spade New York. Sorry!